It’s estimated that 43% of people with Multiple Sclerosis are affected with anxiety disorders. It’s also more common among women. Anxiety in MS can be taxing on a person living with the disease. The under-treated psychological effect of living with the disease can also lead to anxiety. Nowadays, there are many self help groups, books and CDs to help people with nervous illness aka anxiety/panic attacks. 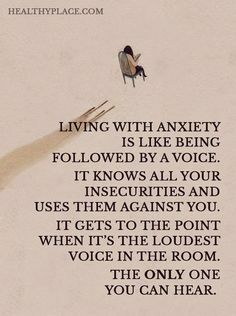 When I had my first anxiety attack I knew what the word anxiety meant but that was about it! I didn’t know any of the things that happen to people when they have an attack. I was very healthy, active and had a good job! At that time very little was written about anxiety in my world of health clubs. My anxiety really took hold of me in 1991. I was lucky enough to have a MS counselor at the time named Elizabeth. She was aware of anxiety with MS patients. I told her some of the nervous problems I’d been having. Elizabeth gave me the name of a doctor who worked extensively with panic/anxiety attacks. The doctor’s name was Dr. Claire Weekes. Dr. Weekes was from Australia and had written several books about panic and anxiety attacks. Since I wasn’t going to Australia when my meeting with Elizabeth was over I drove immediately to a book store. Dr. Weekes’ books were there so I bought one. In Dr. Weekes’ books she explains how to face and overcome panic/anxiety attacks. She explains it all in very simple terms. In the end I eventually bought and read four of Dr. Weekes’ paperback books. I still have them around my apartment somewhere for occasional reading. Dr. Weekes’ first book, published in 1962 was called “Hope And Help For Your Nerves”. This book has sold more than 300,000 copies and has been translated into fourteen languages. The bestselling step-by-step guide that will show you how to break the cycle of fear and cure your feelings of panic and anxiety. I highly recommend this book. To order click on the image below. Back in ’91-’92 I was driving all over Minneapolis and suburbs to bid on commercial carpet cleaning jobs. Why was I so anxious? The answer is that I’d read somewhere that people with MS can lose control of their bowels. Of course, I’d have to be one of those people! That was it! That’s all! I would obsess about it! I’d lay awake at night thinking about it! I’d wake up early to obsess some more! I’d joke to myself that I knew every restroom in Twin Cities. Finally, in 1991 I obsessed so much that I did have a BM driving to a bid! Was it MS though or anxiety? Looking back, I think it was from anxiety!! From that day forward until now in 2018 in my little pea brain I think every time I drive I could possibly have another BM. If I let that thought get into my head the night before I will stay awake all night obsessing. The more you obsess about something like that the worse it gets! You are worrying about nothing! To not think about that though is easier said than done. There was actually a couple of times when I didn’t want to leave my home to do a bid. I literally couldn’t move. It’s like I was frozen! Another time I got to the doorknob in my home but couldn’t turn it. lol Then there was the time it took me four trips to my front door before I finally was able to leave. Folks, I was a real nutcase!! I wondered how I would ever get anything done? If I knew the destination where I was going I usually didn’t have any problems. However, if I didn’t know where I was going my mind would start whirring! Back in ’91 and ’92 I ended up carrying a Weekes’ book with me when I was going to a bid. I remember many times pulling my pickup over and pulling out a Weeles’ book. I would read parts of the book when I’d start having an anxious moment. This was all due to the fact I might have a bowel movement because of my MS. Pardon my language but I was a LOONEY! Looking back, I still had full control of my bowels in 1991! I was worrying about nothing! I lived like that for 20+ years. Even today in 2018 I still have my moments when I get anxious. Now that I REALLY have lost control of my bowels I realize I was STUPID and DUMB to ruin 20+ years of my life! Nowadays, if I have to somewhere I won’t think about that trip until the morning I have to go. Dr. Hazel Claire Weekes MBE, (April 11, 1903 – June 2, 1990) was an Australian general practitioner and health writer. She is considered to be by some as the pioneer of modern anxiety treatment via Cognitive Therapy. The books Dr. Weekes wrote continue to be noted for their dealings with anxiety disorders. Many of today’s anxiety self-help books continue to cite her work. Weekes found that many of her patients suffered from anxiety disorders such as agoraphobia, panic attacks, phobias, generalized anxiety disorder and obsessive-compulsive disorder. In Weekes’ books she avoided using the term “nervous breakdown”. She felt it was unscientific and unnecessarily alarming! She also avoided the term “anxiety state” as she felt it was too “medical” for the purpose of her books. She decided to replace the term with “nervous illness” instead. Dr. Weekes was concerned by the severe long-term effect the disorders had on her patients’ lives. Many people had tried and failed with psychiatric treatments like psychoanalysis. Instead, Weekes developed a program of treatment based on ideas from Cognitive Behavioral Therapy. Weekes noted for example that patients did not suffer from anxiety problems because they had flawed personalities or traumatic childhoods. Rather, the problems were caused by the patient having a habit of fear-avoidance made worse or caused by a very responsive “sensitized” nervous system. She described in her books the three critical downfalls that lead to nervous illness. They are sensitization, bewilderment and fear. She explained that so much nervous illness is no more than severe sensitization kept alive by bewilderment and fear. Dr. Weekes analyzed fear as two separate fears. Weekes explained first fear is the fear that comes reflexively, almost automatically. The patient usually immediately recoils from it and as he/she does this he/she adds a second fear to the first. Second fear is the fear the patient adds to the first fear. Examples of second fear are “Oh, my goodness! Here it is again! I can’t stand it! It is the second fear that is keeping the first fear alive this keeping the sufferer sensitized and keeping them nervously ill.
Weekes’ program was first given to her own patients and then as word spread of its success to others in the form of records and cassette tapes. Eventually, she developed a self-help pack consisting of a book and a cassette. On the recordings Weekes guided patients through a program. She summarized the program as follows. A patient has to face the feared situation, accept the feeling of panic, float through it and let time pass. Weekes’ second book, “Peace From Nervous Suffering” was published in 1972. This classic anxiety-relief guide from the author of “Hope And Help For Your Nerves” has brought solace to over a quarter million readers coping with panic attacks and agoraphobia. I also recommend this book. To order click on the image below. Her third book, “Simple Effective Treatment of Agoraphobia” was published in 1976. Her fourth book “More Help for Your Nerves” was published in 1984. Her fifth and final book “The Latest Help for Your Nerves” was published in 1989, just one year before her death.